Tired of the “Mac reach around”? This hub could be what you need. Apple’s iMac (as well as its discontinued Thunderbolt Display and Cinema Display) are cool, clean-looking devices. 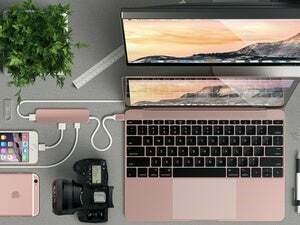 But to me, the sleek appearance comes with one annoyance that I call the “Mac reach around.” When you need to plug in a USB device or a SD Card, you have to reach around to the back of the display. You can’t reach around blindly, either; you have to either turn the iMac or display around to get to the ports, or, if you can’t do that (like if your iMac or display is mounted to to a wall), you have to contort your body in a way to see the ports. For most people, this is a minor annoyance in the overall scheme of things, and if you never need to plug in anything, it’s not an issue at all. But as someone who tests a lot of gear as well as use thumb drives and portable hard drives, it’s a pain. Front-facing ports would be very helpful, but Apple will never do that. So it’s time to turn to an external USB hub. 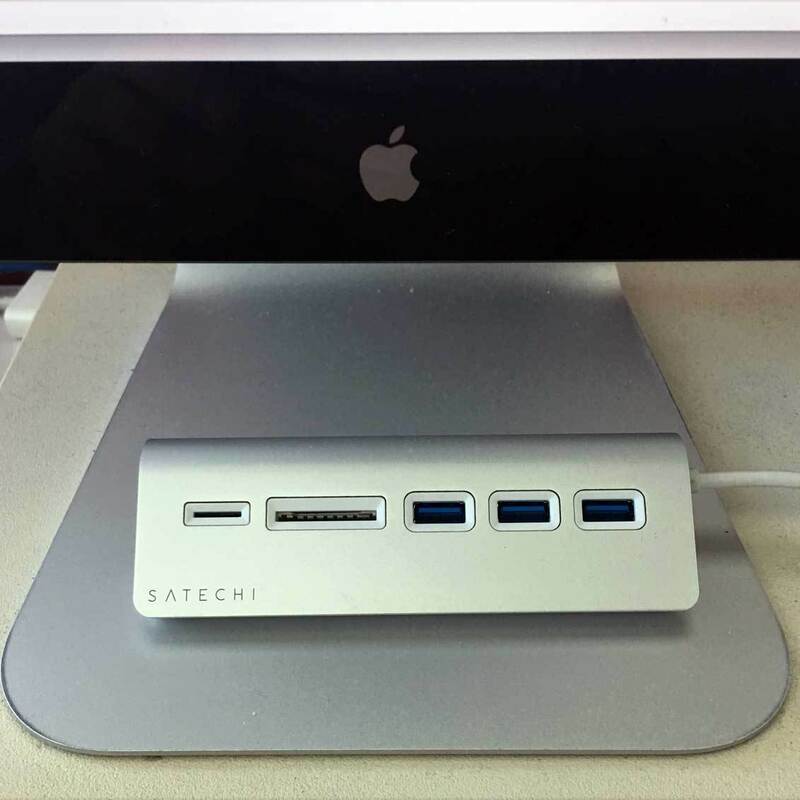 Satechi’s Aluminum USB 3.0 Hub + Card Reader matches well with an iMac or Apple display. For $30, the Satechi Aluminum USB 3.0 Hub + Card Reader fits the bill for my needs. It has three USB 3 ports, an SD card reader, and a micro SD card reader. It’s rated at 5 Gbps. The aluminum finish matches the Apple stand nicely. It has a rubber bottom that grips the surface, so when you’re inserting items into the ports, the hub doesn’t slide around. You do have to hold the hub down when removing items, but that’s done easily enough. The 12.5-inch USB cable on the Satechi hub is long enough to reach the back of the iMac while the hub rests underneath the display, but the cable length does limit where you can put the hub. If you have a Mac under a desk, the cable probably isn’t long enough to reach your desktop. You might need to invest in a USB 3.0 cable extender; Satechi sells a 6.5-foot USB 3 extension cable that’s available in black, blue, red, and white. If you have a MacBook laptop equipped with only Thunderbolt 3/USB-C, you’ll need a cable like Satechi’s USB Type-C to USB Type-A adapter ($10; available on Amazon). I haven’t had any problems using the hub in the month since I first got it. I can see how some might think the SD and micro SD card readers are a waste, but I put them to good use. I still use digital cameras (for the optical zoom and for sports photography), so I use those ports to transfer pictures from the cameras to my Mac. There are plenty of USB hubs to choose from, and many of them are of good quality. 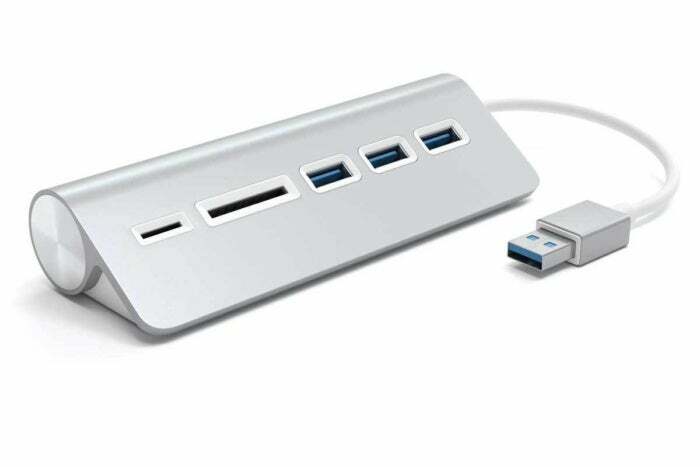 I like the Satechi Aluminum USB 3.0 Hub + Card Reader because it’s a good fit with the iMac and Apple displays.